The findings, publishing in the February 28, 2019 issue of Developmental Cell, focus on the dynamic coupling of microtubule ends to kinetochores, built on the centromeres of chromosomes, to direct chromosome segregation during cell division. The work was conducted using Caenorhabditis elegans, a species of nematode, as the animal model. During cell division or mitosis, the centromere regions of chromosomes assemble large protein machines called kinetochores to connect chromosomes to microtubules, which the chromosomes then use to separate to opposite ends of the cell. 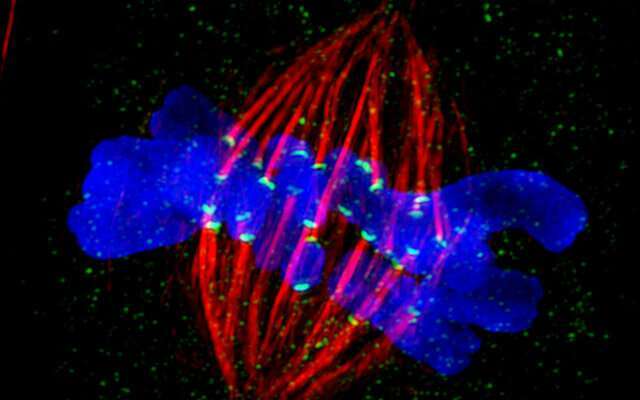 The microtubule-based physical separation of chromosomes ensures that the two new cells born after division inherit a complete genome. In their new paper, Arshad Desai, Ph.D., professor in the Department of Cellular and Molecular Medicine at UC San Diego School of Medicine, and colleagues report that the evolutionarily ancient kinetochore-microtubule coupling machine, called the KMN network, plays a critical role in neuronal morphogenesis —the biological process that causes a cell or organism to develop its shape. "This is an entirely new discovery," said Desai. "We've found molecular similarity between the movement of chromosomes in dividing cells and the formation of neuronal projections, both of which involve microtubule polymers that dynamically grow and shorten." Desai said the findings may help illuminate the underlying pathology of some neurological conditions. For example, he said, mutations in one of the components of the KMN network have been associated with microcephaly, a condition in which the brain does not develop properly, resulting in a smaller than normal head and numerous health and cognitive issues. "Our work suggests a potential explanation for why that happens," said Desai. In related work, researchers at Harvard Medical School report similar findings, working primarily with a fruit fly model.